Large Floss Keys. 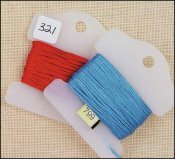 Pack of 100 Bobbins and Stickers  - $16.00 : Yarn Tree, Your wholesale source for cross stitch supplies. Item 8790. Pack of 100 Large Plastic Floss Bobbin Keys and Stickers. New and improved design has a tab to hold the number sleeve off the floss skein or you can use the adhesive stickers to write your own number label, a softly curved top, and two diagonal slits to hold the ends of the floss. Use these sturdy plastic floss holders to wrap your floss and larger threads like perle cotton around. 2¼” tall and 2” wide. Also known as bobbins, floss holders, flossies, and floss winders. Made in the USA.